Salida Recreation is partnering with GARNA, Guidestone, Articipate, and The Maverick Potter to offer Camp Fridays. Programs are broken into two segments: 9-11:45am each day will be with our program partners; 11:45am-2pm each day will be with Salida Recreation. Morning snack provided, please bring lunch, water, and appropriate layers. 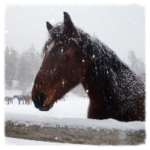 Nov 18 – Preparing for Winter on the Ranch with Guidestone. Explore the Hutchinson Ranch to learn how cows, horses, pastures and ranchers prepare for winter on a ranch. Special treats for the donkey and a hands-on craft project will round out our morning’s explorations. DROP OFF AT HUTCHINSON HOMESTEAD 8913 W HWY 50. PICK UP AT CHISHOLM PARK, 324 HUNT STREET. PRE-REGISTRATION IS REQUIRED. NO DROP-INS ACCEPTED. ALL REGISTRATIONS AND LIABILITY WAIVERS MUST BE COMPLETED AT THE AQUATICS CENTER AT LEAST THREE DAYS PRIOR TO THE FRIDAY CAMP. ALL PROGRAMS ARE $5 PER CHILD. MORNING SNACKS WILL BE PROVIDED. CAMP FRIDAY HAS A STRICT NO PEANUT OR NUT INGREDIENTS POLICY. PLEASE BE RESPECTFUL OF OTHERS’ ALLERGIES AND SENSITIVITIES. Locations/themes subject to change depending on weather. Please view full schedule at www.salidarec.com. For specific program questions, contact Lanette @539-5703 or salida.recreation@cityofsalida.com.